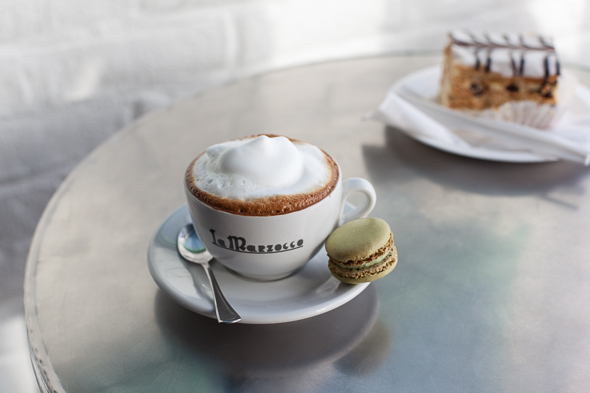 Lamanna's Bakery may be on Toronto's eastern edge (401 and Kingston Road), but it's easily one of the most authentic Italian bakeries the city has to offer. Bakery may be a bit of a misnomer depending on when you go; they're undergoing a massive renovation adding roughly 2000 square feet with the design geniuses from Commute Home . A suspended vintage circa 1950's Vespa that belongs to the owners should add to the Italian aesthetic. Lamanna's Bakery is strictly a family affair, parents Peter and Rosa Lamanna opened the doors 10 years ago at this exact location and work hand in hand with their sons and co-owners Lorenzo, Joe and David Lamanna. Peter hails from small town called Monteleone di Puglia and the flavours and approach to food echo his hometown pride. 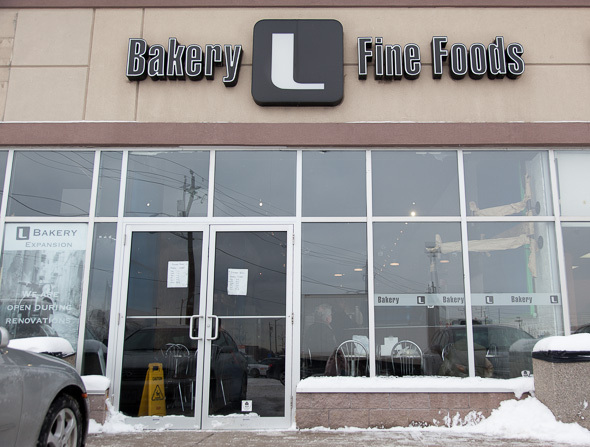 While currently operating as a bakery with a hot counter and grab and go deli fridges offering homemade pizza dough, cheeses and sauces, expect more to come by spring when the renovations are complete and the adjacent space that was formerly a Rogers store will host a gelato laboratory, a stone oven and a deli counter for proper antipasti. With use of their own custom roasted beans, the espresso is top notch -- a double runs $2.00 and a Cappuccino comes in at $2.75. The white brick walls and stainless steel tables and chairs repeat the modern look of the gleaming coffee maker, and the pipe shelving with olive oils, balsamic vinegars and bags of coffee beans are a simple way to showcase their pantry goods. 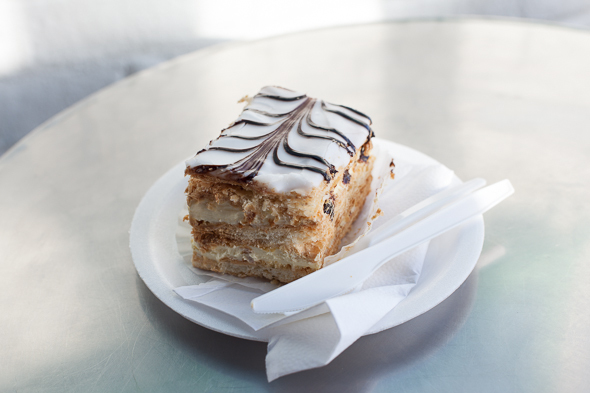 Diving into the baked goods first, the Napoleon ($1.99) is a massive slab of delicate mille-feuille pastry layered with cream and covered with frosting and drizzled chocolate. Fancy French macaron cookies ($1.49 each) come in a rainbow of flavours and are perfectly round and seductively sweet. Gigantic Lobster Tails ($2.99 - top photo) seem bigger than the real thing, and just as buttery. Doused in icing sugar, these show stopping pastries are like a croissant on steroids. Gentle sheets of pastry beguile the sneaky rich filling inside, a creamy blend that complements the outer layers perfectly. 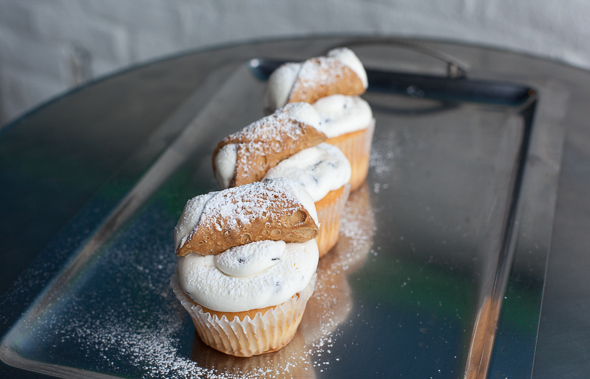 The cannoli here come in many variations, notably with the inclusion of a serious hybrid creation, the Cannoli Cupcake ($2.49). Perched upon a sweet vanilla cupcake comes a perfect sized cannoli stuffed with creamy chocolate chip filling, which somehow manages to stay crispy on top of the cupcakes frosting. A dusting of icing sugar just adds to the allure. 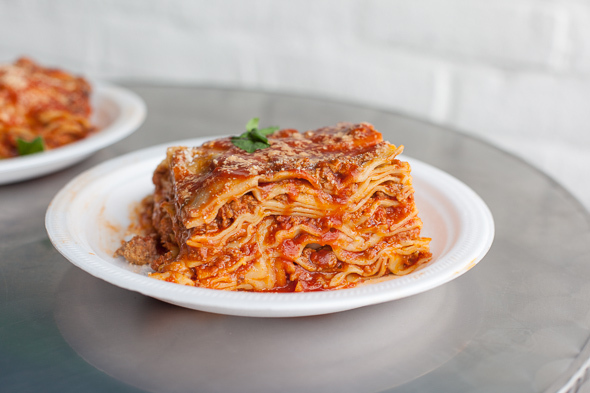 Hot food items fare just as well here, with a generous portion of Meat Lasagna ($5.99 with a side bun) looking ample enough to feed you and a few friends. Simple ingredients do all the work; the tomato sauce and chunks of ground beef provide meaty sustenance and the sheets of fresh pasta contain the cheesy goodness that's been perfectly baked. 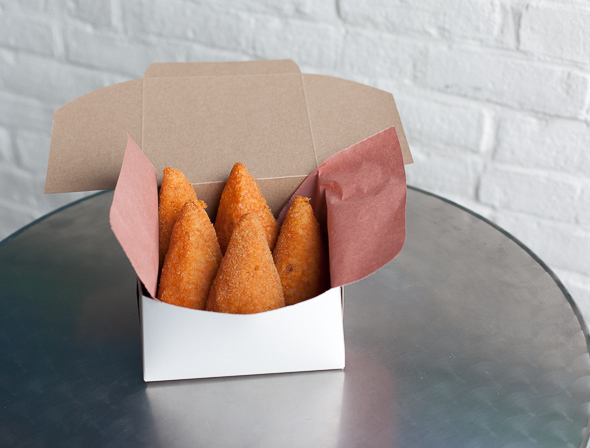 Sicilian Arancini ($2.99 each) are a must order here. Usually smashed into doughy rice balls, these all-stars are formed into mini pyramids that are a superior shape for containing the gooey insides. Crispy-fried without being greasy, grab them with a side of tomato sauce for dipping for an extra fifty cents. With a slick modern design and a dedication for old world recipes mixed with fresh food trends you can see the family run business is truly a blend of both generations. It's hard to find many negatives here.